Origin of the Primary 51J-2 - I was initially given a cosmetically very nice 51J-2 by my old ham friend, W7ZCA, Paul Eisenbath (now SK,) in exchange for re-capping his Collins 75A-4 receiver. Paul had been given the 51J-2 at sometime in the past and had done some rework on it. At one point, Paul had the receiver setting on the floor of his workshop with the bottom RF shield off, exposing the ten crystals of the Crystal Oscillator circuit. Paul's young grandson, who was probably about 4 years old then, found the temptation of the small shiny and removable crystals irresistible and pulled all of them out of the holder and hid them around Paul's workshop. This removal and hiding was all accomplished while Paul was off in another room. In fact, it was several days before Paul even noticed that the crystals were missing. Of course that was enough time for his grandson to forget where he had hidden all ten crystals. Paul was able to find a few of the crystals but seven were still missing. A telephone call to International Crystal Manufacturing Company had surprising results. After Paul told the sales person the story of how the crystals came to be missing, they found the story so charming that they sent an entire set of ten crystals for the 51J-2 to Paul - free of charge. So, that was the condition of the 51J-2 receiver when it was given to me. I tried to use the receiver with the worn gearbox but it seemed like sooner or later (probably sooner) it was going to break something in the gear train. I decided to look for a parts set to rob the gearbox from to correct the problem. photo above: The 1950 Collins 51J-2 showing the metal dial bezel, the square illuminated Carrier Level meter, the green "ham band" highlighting on the megacycle dial scale and the Collins' winged emblem - all characteristics of the early 51J receivers. Finding a Suitable Parts Set - After a few months, a suitable 51J-2 showed up on eBay. Nobody seemed interested in it since it was in fairly rough cosmetic condition. 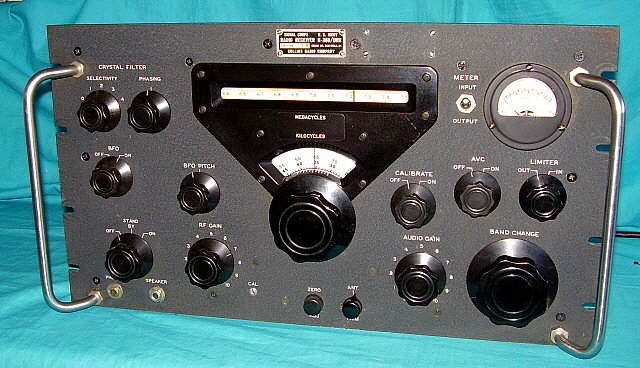 The operational condition was described as a "fun radio" - whatever that meant. So, two hundred dollars later I was the owner of another 51J-2 receiver. When the second 51J-2 arrived, I found out what a "fun radio" was - totally and incompetently reworked beside being non-functional with a repainted front panel in black paint with white rub-on lettering. I swear that the eBay photos were of a different front panel but by that time the seller had pulled the auction photos. It really didn't matter because all I wanted was the gearbox and that was in good shape. The plan was to use two 51J-2 receivers to build up one nice condition, fully functional receiver. In checking over the two receivers, it seemed easier to use the chassis of the second receiver as the starting point and rebuild the entire receiver using the best parts from both units. This allowed me to skip the tedious removal of the gearbox which certainly would have resulted in many synchronizing problems. >>> >>> The second receiver had been incompetently reworked and several of the front end coils had broken wires that were their connections to the trimmer capacitors. Also, all of the high quality tubular ceramic capacitors had been replaced with cheap disk caps. I decided to strip out the receiver from the front of the IF section back to the audio output and start over. I reinstalled the high-quality tubular ceramic capacitors harvested from the first 51J-2. I rebuilt the entire front-end of the receiver to repair the many broken coil leads. I had to replace the third conversion input coil because it looked like it had been burned. All parts used were either new parts or good ones harvested from the first receiver. 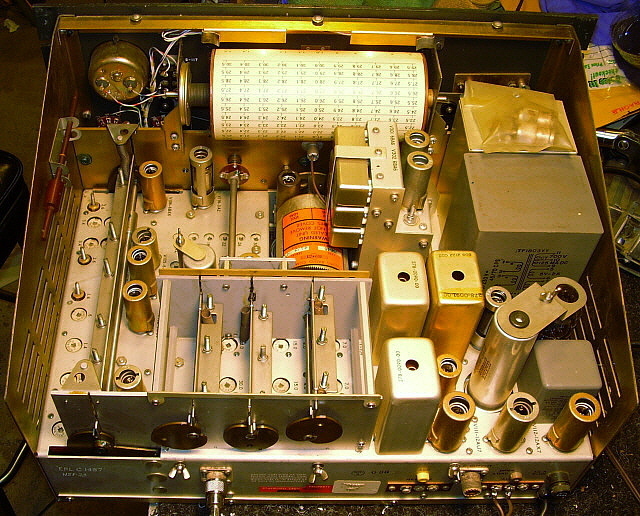 Once the electronic rework was complete, the front panel, the knobs, the megacycle drum dial, the meter and many other parts were transferred from the first 51J-2 to the new rebuilt receiver. I ended up with a great looking, complete 51J-2 - but how did it work? Troubleshooting - Upon power-up the new rebuilt 51J-2 seemed to be working fine. I performed an alignment and the receiver worked fine - or did it? After about 30 minutes of operation the sensitivity dropped down to where signals barely moved the carrier level meter. From the start, the audio would distort if the RF Gain control was higher than 8 when in AVC. Clearly, there were a few more bugs to work out before the receiver could be called "complete and working." However, other projects came into the shop and the 51J-2 was put on the shelf and temporarily forgotten. In fact, "temporary" ended up being about three years before I got back to the receiver. I had recently been told that Paul W7ZCA had become an SK and that had me reflecting about all of the "deals" we had exchanged over the years. I remembered the 51J-2 and thought that I should probably finish that receiver since it was such a nice looking example of a fairly rare Collins. The strangest problem was the erratic variable gain of the receiver. 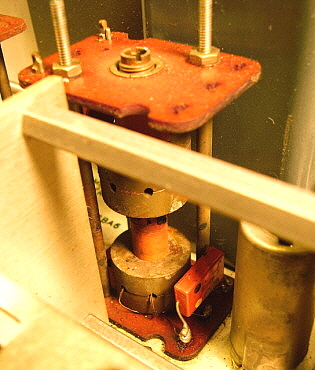 When on the bench in the normal position the gain was down but when the receiver was placed up on its side to troubleshoot the gain would then be somewhat normal. I could even tilt the receiver about 20 degrees and get the gain to go up and down with just a slight change of the angle - weird. >>> >>>To narrow the problem down I used a clip lead type scope probe and measured at various points in the receiver while tilting the receiver back and forth on the bench. I had to inject a fixed-level signal into the receiver's antenna input so I knew the variations in the gain were occurring because of a fault and not the signal level changing. I could see the gain change problem was occurring just past the first IF amplifier tube. All components and the tubes had already either been checked or replaced except the IF transformer itself. I removed the IF transformer cover and discovered that the coil and the ferrite shields were at the bottom of the mount and loose. Apparently, moving the receiver around changed the position of the IF coil which changed the coupling and resultant gain. Upon removing all of the IF transformer covers, it was discovered that every IF transformer had loose coils, loose ferrite shields or both. Complete removal and rebuilding of all of the IF transformers was necessary. I used epoxy to secure the ferrite shields in position. I actually used the IF transformers from the first 51J-2 because they were in better overall condition but still required securing of the ferrite shields to prevent future problems. Upon power-up, I had more gain through the 51J-2 than ever before and an IF alignment only improved the response. 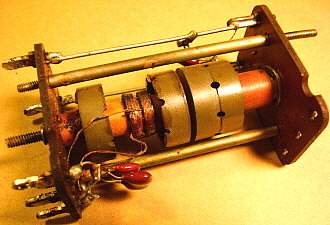 photo above: A 51J-2 IF Transformer showing the coil structure beneath the ferrite shields. Note that this transformer had the mica caps replaced but nothing was done to secure the ferrite shields. photo above: The 51J-2 after rebuilding Although I thought that the IF transformer problem solved everything that was wrong with the 51J-2, I soon discovered that the AVC would cause distortion after several minutes of operation. I had already replaced all of the tubes in the receiver with a set that checked fine on the TV-7 tube tester. However, you can't find all tube problems with a tube tester. Once the AVC started to cause the distortion, I replaced the AVC amplifier tube with no change in the problem but changing the Dectector/AVC Rectifier tube cleared up the problem. I had already rebuilt that entire section of the receiver so I was sure the problem had to be tube related. An additional problem was only on the AM BC band or Band 1. Low gain was the result of a defective mixer coil that appeared to have gotten very hot. Fortunately, the first 51J-2 receiver provided a good condition coil. These coils are easy to replace as they are only held in place by two tangs that have to be pushed inward to dismount a coil and "snap" into place when installing the coil into the mounting hole. The wire leads are the same diameter as the coil wire itself and the connections to the trimmer capacitors is fairly delicate so care must be taken in the removal and installation. A full IF/RF alignment had already been performed early on the receiver and a quick touch-up was all that was necessary for top performance that is at or better than the original specs. Audio is very nice as I did replace the .01uf across the audio output transformer with a .001uf to increase the high frequency audio response. I am running the receiver into a 12" 4 Z ohm speaker in a large cabinet and the response in very nice with some bass on SW BC stations and powerful ham AM stations along with enough highs to significantly reduce the normally "muffled" audio quality. 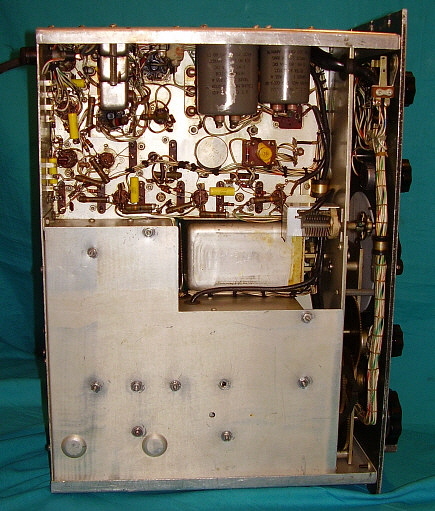 photo above: The back of the 51J-2 showing the unique slanted top cover that is used on all of the 51J Series receivers. The top cover must be installed even if the receiver is installed into a cabinet. The top cover shielding eliminates some spurious oscillations that will be tuned at various frequencies throughout the tuning range. Note the ID plate - this is NOT standard. The ID information is typically silk-screened to the rear of the chassis. This particular 51J-2 had holes drilled thru the information so a suitable "data plate" was made from a derelict "parts set" 51J-2 chassis. 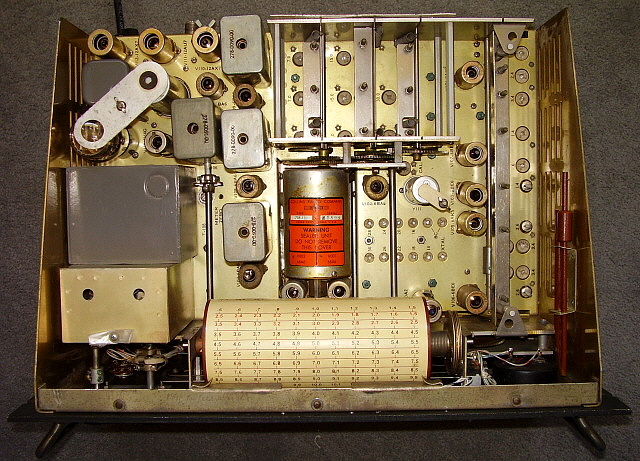 photo above: The underside of the a 51J-2 receiver showing the smaller bottom shield that only covers the front-end of the receiver. Note that some of the capacitors have been replaced on this 51J-2 while the .01uf tubular ceramic capacitors are still in place. 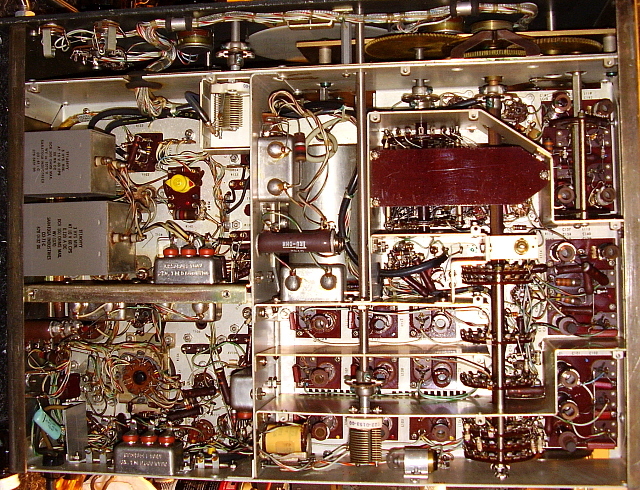 photo above: One common problem encountered on the 51J-2 receiver is inside the IF transformers. The entire lower coil and ferrite shield have loosened and have slid down to the bottom of the transformer. This reduces coupling and output level of the transformer. To correct, the IF transformer must be removed, the coils put back into their proper position and then secured with epoxy to prevent future movement. Rough handling of the receiver such as "slamming" in down on a work bench or dropping it from a foot or so down onto the pavement at a swap meet is the probable cause. 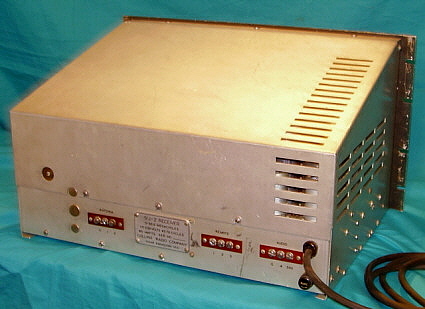 The R-388 is the most commonly encountered version of the 51J series of receivers. Many thousands were built for the military over a period from 1950 up to 1962. As a result, parts are fairly easy to find which makes a rebuild easier to accomplish. However, just because there are lots of spare parts and parts sets around doesn't mean that the parts needed will be cheap - they aren't. Mainly because of the "Collins" name but also because any parts taken from any R-388 almost relegates that receiver to "not restorable" status which can be a difficult decision for the owner to make. The following "basket case" is not typical of that status since most of the parts were present. 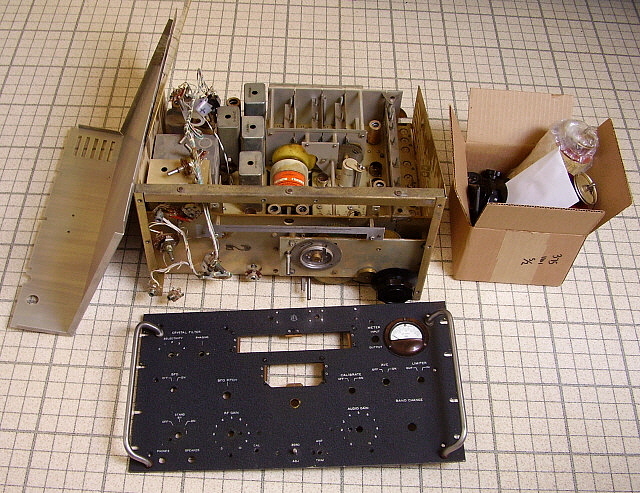 Just the receiver was mostly disassembled. 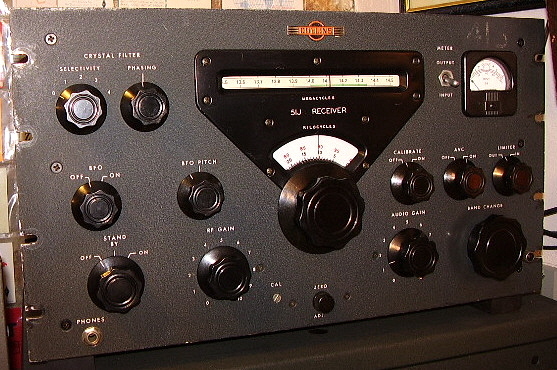 The Basket Case - A friend of mine had the luck to find three R-388 receivers locally. They had been listed on Craig's List. His telephone call to me was mainly for advice on how to "power-up" the three receivers. I told him that typically R-388s will pretty much work "as found" but it would be a good idea to thoroughly check the filter capacitor and to test all of the tubes before applying AC. This was accomplished but he found that none of the receivers seemed to work. I was asked if I would "take a look" at them. We made a deal that I would service and align the two best receivers in trade for the worst of the bunch which by this time had been disassembled for parts needed in the other two receivers. I delivered the two serviced and aligned R-388s and picked up the "parts set" R-388 while at a ham swap meet in Reno. What I got was the R-388 chassis, the front panel and a box of parts. The gearbox and the main band switch had become de-synchronized during some of the disassembly. Also, about half of the tubes were missing as were nearly all of the screws. I was able to have the screws sent to me through the mail. I had plenty of tubes so that wasn't a problem. Really, all that was necessary was to put the R-388 back together and go from there. The front panel was in exceptional condition and had been cleaned by the former owner. The kilocycle glass was missing but I had a glass piece from a "parts set" 51J-2 that fit correctly. When I purchased a "parts set" 51J-2 to complete the rebuild of another 51J-2 receiver I was lucky enough that the "parts set" 51J-2 that had an almost perfect R-388 megacycle drum installed. Fortunately, the original 51J-2 megacycle drum was excellent so I really didn't need the R-388 one that came with the "part set." It was so nice though I saved it and wrapped it up in plastic to protect it. So, here it was a few years later and I was rebuilding an R-388 that had a very well-worn megacycle drum. Obviously, that saved megacycle drum had "saved the day." photo above: The R-388 chassis after restoration. Note the megacycle drum - this is an original drum scale, not an overlay. Note the plastic bag piece on the Crystal Filter housing. These bags usually contained some spare parts, connectors, etc. The alignment tools are reproductions. Synchronizing the Band Switch to the Gear Box - This is really much easier than it sounds. Since the gear box has mechanical stops at each end all that is necessary is to know which way the Megacycle knob is rotated to change bands in the proper direction. Since counterclockwise rotation increases the frequency, rotation clockwise to the end stop would be the .5 to 1.5 mc band or Band 1. Once Band 1 is in position then a check of S-106 can be visually accomplished to see where the arm of the switch is. By checking the schematic versus looking at S-106 it was determined that the switch was actually on Band 2 and all that was necessary was to loosen the set screws on the coupler from the gear box to the band switch and then rotate the switch shaft until Band 1 was in position and then tighten the coupler set screws. Rotating through all thirty band positions did verify that the switch rotated from position 1 to position 16 and then from Band 17 to Band 30 the switch shaft did not change position. Then when returning from Band 30 down to Band 17 no change in the switch shaft position but with Band 16 on down to Band 1 the switch shaft did rotate correctly and stop in position one. While doing these tests all of the other movements of the slugs and slug racks were verified and no problems were noted. Dial Drum Drive Cable and MC Dial Pointer Cable - These are special metal cables that have a plastic covering over them. Luckily, both cables were present but were loose in the box of parts. I think the cable material is available from various Collins suppliers and the dimensions and installation instructions are in the manual if your R-388 is missing these cables. A Different Carrier Level Meter - Most R-388 receivers will have a Burlington sealed carrier level meter. These high quality metes have a metal housing and metal scale. 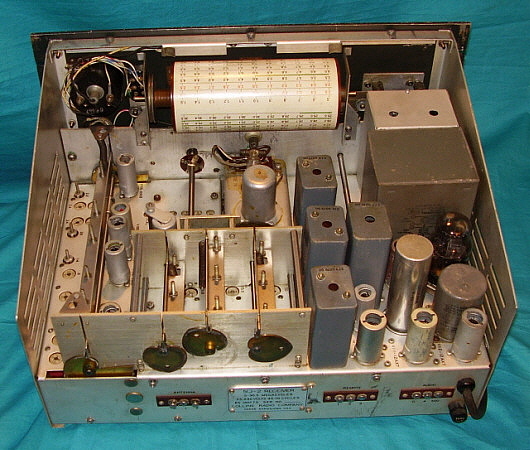 The meter installed in this R-388 was built by Marion Electric Instrument Company. Probably a field replacement. It has a convex face with gloss finish mounting flange with a sealed metal housing. Repro ID Tag - As can be seen, this receiver originally had two data plates installed that had been removed in the past. The center tag was the serial number identification plate and the tag to the right was a "Caution" tag that informed the user to refer to the TM manual. Luckily, there are a few repro tags available from Mike Chanter (Collins Radio Association.) He supplies a 1950, 1953-54 and 1957 type tags. Since this R-388 was probably built on a 1951 contract, I should have gotten the 1954 tag but instead I bought the 1950 version. The thinking was that the MFP date of "JAN 52" would have to be from an earlier build, thus the 1950 tag. However, knowing that Collins built R-388 receivers an put them into inventory for later contract sales, maybe the 1953-54 tag would have been a better choice. 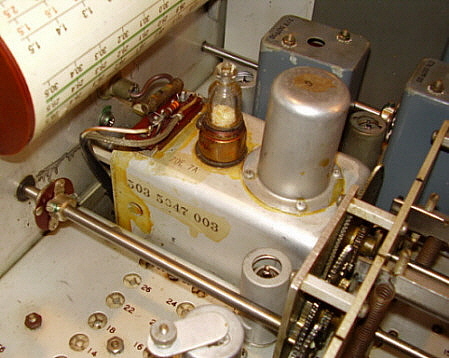 Knobs and Tubes - Since this R-388 was a "basket case" it naturally didn't include the knobs or many of the tubes. Luckily, I had a complete set of Daka-Ware knobs that had come with the "parts set" 51J-2 receiver. I did have to search through the junk box to find a set of Daka-Ware kilocycle and megacycle skirted knobs since those weren't on the 51J-2 "parts set." Most of the tubes missing were the 6BA6 tubes. In fact, the R-388 uses seven 6BA6 tubes. Also, missing were the three 6BE6 tubes, the 6AQ5 and the 5V4 rectifier. All tubes were found in the tube "junk" boxes. All tubes used in the R-388 should test well above "minimum acceptable" for best performance. Restoring the Dial Bezel - The dial bezel had been broken at one time and glued together to repair. The break was at the bottom of the bezel - an area hidden by the skirt of the main tuning dial. There was also a chip in the opening for the kilocycle dial glass. I decided to use an epoxy fill to repair the break because there were some missing sections. Tape dams were used and epoxy was layered to complete the fills. After the epoxy had set-up the areas were leveled by filing and then polished. Usually I would have used black power coloring for the epoxy but I didn't have any around so I carefully applied jet black nitrocellulose lacquer and polished this to match the bezel bakelite. To finish the bezel required filling the engraving "MEGACYCLES" and "KILOCYCLES" along with the "tick marks" for the kilocycle index. I used Artist's Acrylic mixed to a manila color and applied with a brush. The fill paint is left to set up for one minute and then a paper towel piece dampened with Glass Plus is used to remove the excess fill paint. The end result was a bezel that looked great and had repairs that were very difficult to see. New Power Cord - The original power cord had been cut on this R-388/URR. The plastic strain relief was broken when trying to remove it. Fortunately, most larger hardware stores carry the correct type of power cable and also the same style of plastic strain relief. IF and RF Alignment - The alignment procedure in the TM has a few steps that are outdated. This is because today we have easy access to digital frequency counters that are extremely accurate. When the TM directs you to use the R-388's Crystal Calibrator to "beat" against the signal generator's 500kc input to be sure that it is accurate, it's because back in 1950 that was the most accurate way to assure that 500kc was the input signal. Today's digital frequency counter (or synthesized signal generator) is just as accurate and much easier to use. I like to check the Crystal Filter's crystal frequency just to be sure. Usually that crystal is within 0.01kc or so of 500kc but I use that frequency of the crystal as the IF. This assures that the Crystal Filter works great (and they will - if you take care in the IF alignment.) As to why the TM directs you to "load down" the IF transformers with an RC load consisting of a .01uf capacitor and a 47K resistor in series, I believe that was to assure that the alignment tech wasn't going to overload the IF with too much signal and therefore slightly misalign the IF because the input signal was so broad and strong. Keep the IF input signal level low and do the IF alignment with the Crystal Filter on and in position 4 and your alignment will be accurate. You can install the load if you want too but I don't think it's necessary if you watch the level of the signal generator carefully. Though the special alignment tools (that are always missing) will help with the alignment they are not strictly necessary. Reproduction tools are available so you can obtain a set and try them out. I think the original alignment tools make the trimmer caps easier to adjust but not the slugs. The IF is easier adjust with the proper alignment tool, also. Variable IF and RF Alignment - Signal is injected into the Antenna Input SO-239 connector. Align the Variable IF sections first. There are two sections, odd and even, requiring different frequency inputs. Alignment is standard in that the trimmer caps adjust the high end of the range and the slugs (inductance) adjusts the lower end. RF tracking is straight forward but you will only have to adjust six ranges as the remainder of the bands are tracked by heterodyne action. Mechanical set-up of the kilocycle dial and the PTO should have been performed before the tracking alignments. All 70E-15 PTOs will have some end-point error unless they are removed and calibrated. If you are satisfied with the EPE and it happens to be a few kilocycles then be sure to use the peak of the receiver output at each calibration frequency rather than the actual dial readout. For example, if you have to align to 7.40kc but the actual peak output is on 7.402kc, then use 7.402kc readout on the receiver and 7.40kc input on the RF generator and then adjust the proper trimmers or slugs for peak output. The more end-point error there is in the PTO the further out this procedure becomes but for just a couple of kilocycles of error it works fine. The correct procedure would be to rework the PTO for zero error and then all of the tracking will be accurate. R-388/URR Performance - I've worked on many R-388s and this of course includes many full alignments. Probably the most important improvement that can be performed on the R-388 receiver is to do a full alignment. It's surprising how far out the alignment can be and the receiver still seems to be performing fine. So, this evaluation of R-388 performance is for receivers that are in good condition and have had a recent full IF and RF alignment. 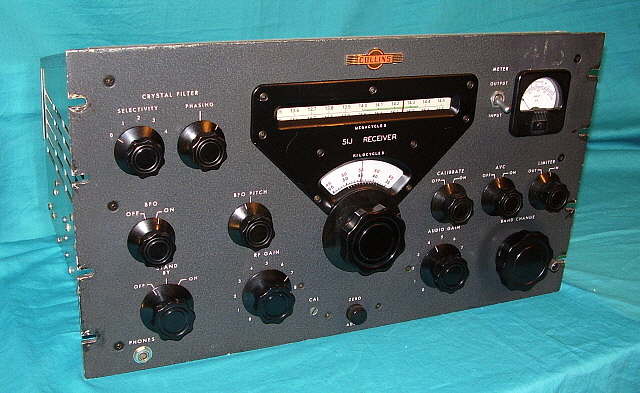 The R-388 is probably the overall best performer of the entire 51J Series for vintage AM ham stations. This is because it doesn't have the mechanical filters that were installed in the 51J-4 receiver. Though the MFs are great for SSB and CW, the 6.0kc filter is not particularly ideal for AM reception. This is because Collins' engineers were thinking "communications" (and primarily data communications) and not wide-bandwidth audio reproduction. The R-388 relies on the designed-in bandwidth of the fixed IF section of the receiver which is probably around 8.0kc at 3db down or a bit wider. However, the IF passband curve is more bell-shaped rather than the steep slopes of the Collins' mechanical filters. So, the first "plus" is the IF bandwidth of the R-388 for AM reception. The audio output 6AQ5 does have a capacitor from plate to B+ for impedance matching which on the earlier J-1 and J-2 receivers seriously limited the upper audio response but the R-388 changed the value of this capacitor to 6800pf which doesn't affect the audio response. So, you should expect your R-388 to sound just a little limited in the upper end of the audio range but most listeners find this audio to be "pleasingly mellow." Dial accuracy is legendary and is plus or minus one kilocycle if the receiver is calibrated to the nearest 100kc point on the particular band in use. Ultimate accuracy is limited by the 70E-15 PTO which is also legendary for its end-point error problems. Most R-388s will have around 6kc of EPE which can usually be adjusted out. Greater EPE requires PTO rework to correct. When the EPE is adjusted out, the receiver is dead-on accurate. Unfortunately, the 70E-15 PTO must be out of the receiver to perform the EPE adjustments. There are some special tools that have been built by enthusiasts that allow the adjustments to be accomplished without PTO removal but they are difficult to use. Stability is solid and drift-free. Sensitivity is competitive. As a comparison, one might find that the R-390A is a bit better at digging out signals especially if the R-390A has been rebuilt and aligned. Still, with a good antenna, the R-388 will hear just about any signal on the band. Selectivity is entirely controlled by the use of the Crystal Filter. Why many hams refuse to use Crystal Filters is a mystery. CFs really do a good job at reducing QRM. On AM, select position 1 or 2 and adjust the Phasing for minimum bandwidth. Then tune the AM signal "on the noise." You'll find most of the interference is gone or greatly reduced. If adjacent frequency SSB activity is a problem then adjust the Phasing slowly and you'll find a point where the dominant audio frequency of the SSB QRM is attenuated substantially. Use the same procedure for SSB reception. For CW, with the CF on you can tune the CW signal off of zero slightly to find the "peak" response. The peak response can also be adjusted with the Phasing control and slight tuning of the signal. The Phasing control can be used to reduce specific audio tone frequencies, that is, to eliminate AM heterodynes. Heterodynes were quite common when there were a lot of AM signals on the ham bands but, nowadays, most AM activity is on nets and one doesn't usually encounter heterodynes too often. On CW, the CF can reduce interference from a nearby CW signal by this heterodyne elimination method. When trying to eliminate CW QRM or an AM heterodyne adjust the Phasing control slowly. The "notch" is very narrow and it can be easy to miss its effect on the interference if the Phasing is adjusted carelessly. Set-up for station receiver operation is somewhat involved since the Break-in function does require a separate +12vdc power supply that is switched with the transmitter's antenna relay auxiliary contacts. I built a very small +12vdc power supply housed in a metal box. It can be switched on by connecting the AC input to the same transmitter terminals that drive the dow-key relay. Upon transmit, the +12vdc is actuated along with the dow-key and the receiver muted. Or, if the transmitter has a built-in antenna relay with only auxiliary contacts available (like the ART-13) then the +12vdc power supply AC can be connected to the 120vac line and the +12vdc output connected to the auxiliary NO contacts of the transmitter relay. Closure of the contacts connects +12vdc to the receiver to actuate the muting relay. Remember to always provide the Break-in function for the R-388 as this disconnects the antenna within the receiver and protects the input circuits from excessive RF levels. Better audio is obtained from the 4.0 Z ohm output with a matching Z speaker. The 600 Z ohm output was for driving data devices and requires a matching transformer to operate a standard Z speaker. Though the R-388 will "pick-up" signals with a minimal antenna best performance is with a full-size, impedance-matched (tuned) antenna. With a first-class antenna, the R-388 will hear everything that is on the air with conditions being the only limitation. UPDATE: July 17, 2016 - As restorers, we're never, ever quite through with a project. We're always keeping an "eye out" for parts that would either enhance our restorations, or, to maybe add a "missing part." This was the case with the R-388/URR profiled above. Our first find was to add the original data plate,...not an original,... THE original. I was able to talk the fellow who had removed it into trading the original data plate for the reproduction tag I had on the receiver. Now the data plate reflects that this R-388 is from a 1951 contract. The second find was probably a year later when a nice condition Burlington carrier level meter showed up on eBay at a reasonable BIN price. It was acquired, restored and installed. The photo to the right shows the R-388 after these parts were installed - July 17, 2016. Now, if I can just find the "Warning" tag that mounts next to the data plate. IF Alignment with Mechanical Filters - Since the 51J-4 uses mechanical filters to define the IF passband, it is essential that the IF be centered for the mechanical filters and the crystal filter. Usually an accurate setting of 500kc on the signal generator is okay but it's better to use the crystal filter crystal frequency to set up the IF on the signal generator. With the Crystal Filter on and set to position 3 or 4 and mechanical filter 3.1kc selected, sweep through the IF and note where the crystal "peaks." Usually it will be very close to 500kc - within 0.01 or 0.02kc of 500kc is normal. Note on the digital frequency counter the exact frequency and then make sure that when performing the IF adjustments that the signal generator has not drifted or changed frequency. Again, you must keep the signal generator frequency at the crystal frequency exactly! It's a good idea to do the adjustments to the IF transformers with the Crystal Filter turned on and set to position 3 or 4 and with the Phasing set to the narrowest response. Monitor the Diode Load output with an analog VTVM and keep the signal generator output at a level that produces about -7.0vdc on the Diode Load. Connect the signal generator through a .01uf capacitor to the grid of the last Mixer V-107. The manual indicates that a RC load consisting of a .01uf cap and a 47K resistor needs to be connected to the IF transformers as they are adjusted but I don't bother since we are carefully and accurately controlling both the frequency input and the signal level into the IF section of the receiver. Peak all of the IF transformers top and bottom and also the adjustment on the mechanical filter assembly. Recheck to be sure that all adjustments are at peak at the correct input frequency. Disconnect the signal generator and the VTVM. Test the IF alignment by tuning through a broad AM signal with the 6.0kc filter selected. Carefully listen to the signal as you tune from one end to the other. You should hear the AVC attack at the low end of the signal's passband, then the signal will clear up and as you tune through about 6kc or so, the signal should stay constant and clean. You will hear the AM signal narrow in audio bandwidth as you approach the center of the 6.0kc filter but the signal level should remain constant with no distortion. As you tune out of the high end of the signal's passband the AVC will react to the noise as the signal is reduced by the steep slope of the mechanical filter. This should be repeated for the 3.1kc filter and the 1.4kc filter also. Other than the importance of the centering of the IF for the mechanical filters, the 51J-4 aligns just like the R-388. The procedure in the 51J-4 manual is somewhat different but the receiver is exactly the same as the R-388 with the exception of the mechanical filters so the R-388 procedure can be used , if necessary. photo above: The top of the chassis on a 51J-4 receiver. Note the mechanical filter assembly to the right and partially above the PTO. The three mechanical filters are the plug-in rectangular units. photo above: Under the 51J-4 receiver 51J-4 Performance - For dial accuracy, stability and selectivity, it's hard to beat the 51J-4. Mechanical filters provide a superior selective ability to all but eliminate most QRM. Sensitivity is very good or at least competitive. Where the 51J-4 has problems is in its audio reproduction. To say the receiver sounds awful on AM wouldn't be too much of an exaggeration for an audio purist. I've owned two 51J-4 receivers and both of them sounded pretty much the same on AM. The AM signals are usually tuned with the 6.0 kc mechanical filter selected. What is noticed is that on either side of the passband center the audio range is pretty good but at passband center the audio is "muffled." This is because the 6.0 kc filter is limiting the audio response to 3.0 kc at the highest. On either side of passband center you are tuning to one sideband or the other of the AM signal and the audio response can go up to 6kc or so and thus the audio highs sound better. This is normal for the 51J-4. In fact, Collins recommended that when tuning AM to use one sideband or the other depending on receiving conditions. On SSB, the 51J-4 works quite well if it is operated as a typical early fifties receiver without a product detector. The same goes for CW reception. Of course, the 3.1 kc and the 1.4 kc filters can be used in those modes for greater selectivity. You can get away with the 3.1 kc filter in AM if QRM is particularly bad by selecting one sideband or the other depending on where the QRM is. Those who are 75A-4 users probably wonder why the Crystal Filter continued to be used when MFs are provided. The Crystal Filter is actually better for certain kinds of QRM, especially heterodynes or adjacent frequency SSB signals. The Crystal Filter Phasing can eliminate that kind of interference where the MFs can't. For SW BC the 51J-4 is okay but still the limits on the audio reproduction have most of the SW BC sounding pretty bad. Remember, the 51J-4 was primarily for communications and the basic 51J design was for data reception, not voice. The dial accuracy meant laboratories didn't have to have frequency meters anymore. Same with many of the military installations. Dial accuracy, frequency stability and excellent selectivity was what most users were interested in when purchasing a 51J-4. Great audio reproduction was not even considered since the passband had to be kept narrow for selectivity. 1. 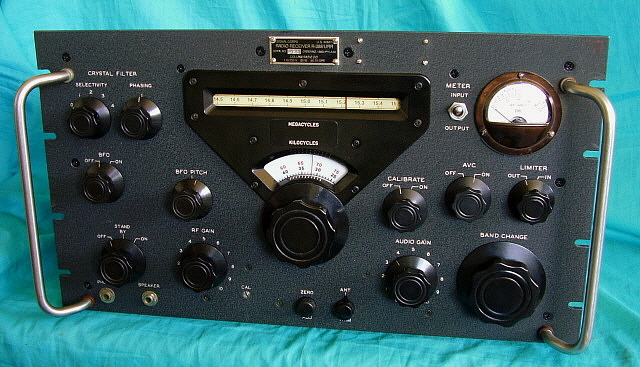 Nick England's great website www.navy-radio.com has a very detailed section on the R-388/URR receiver and all of the variations. Also includes some info on the 51J-4. 3. Thanks to all of the 51J Series enthusiasts for conversations, information and anecdotes that have been exchanged "on the air," online and in person.